Citrix Ready partner, eG Innovations has been chosen as the exclusive performance monitoring and diagnosis solution provider for Citrix Summit, January 9 – 11, in Anaheim, California. Our global partner and sales conference will provide the perfect platform to demonstrate its latest release, eG Enterprise 6.2.
eG Enterprise’s performance monitoring and auto-diagnosis technology helps organizations monitor all aspects of Citrix user experience (logon times, application launch times, screen refresh latency, etc.) and automate, accelerate, and optimize performance management across mission-critical environments. This saves IT professionals, hours or days of work, and greatly improves overall service delivery for increased productivity, customer service, and profitability. 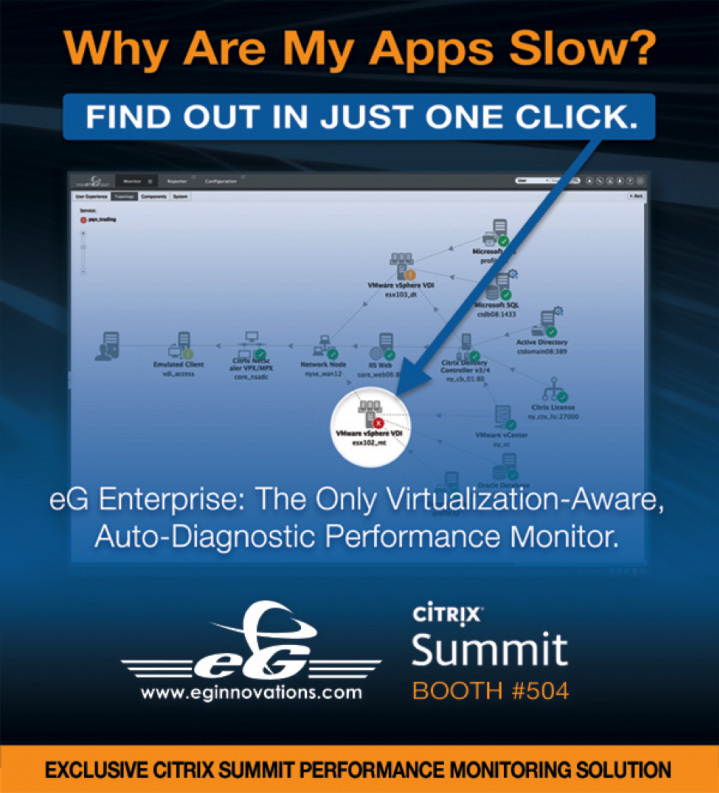 Also, since mid-2015, eG Innovations’ flagship product, eG Enterprise, has been used as the exclusive performance monitoring and diagnosis solution to manage the on-site physical, virtual and cloud infrastructures for our major annual industry conferences, Citrix Summit and Synergy, and will continue this support with Citrix Summit 2017 – monitoring performance for all live demonstrations, keynotes, labs and more. eG Innovations will be at Booth #504 in the Citrix Summit 2017 Solutions Expo in Anaheim. One-on-one demonstrations of eG Enterprise 6.2 will be available for walk-up visitors, and all scanned visitors will be have the chance to win a free Google Home Smart Speaker & Home Assistant through a lucky draw. The winner will be announced at the end of the final Solutions Expo session on Wednesday, January 11th. eG Enterprise is Citrix Ready for Citrix XenApp, Citrix XenDesktop, Citrix XenMobile, Citrix XenServer and Citrix NetScaler. It can also be integrated with Citrix Director and Citrix NetScaler Insight to provide a single pane of glass view into the Citrix infrastructure. eG Innovations also provides a Universal Management pack for Microsoft SCOM that allows Citrix technologies and other virtualization technologies to be monitored directly from the Microsoft SCOM console. eG Innovations’ end-to-end monitoring and auto-diagnosis technology is a critical component of any successful Citrix deployment strategy. The Citrix Events team trusts eG Enterprise to help them ensure a great partner experience at Citrix Summit 2017. So go ahead and get all that you need to know on performance monitoring at the eG Innovations booth.. Visit on-site: Booth #504. Online: https://www.eginnovations.com/citrix.